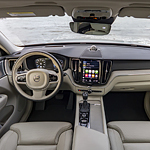 The team here at Volvo Cars Annapolis have been especially impressed by the new Volvo XC60's energy-absorbing interior. This feature helps to keep you protected in the event of a collision. All of the XC60's doors and panels are padded with a specially engineered energy-absorbing material that helps to reduce the severity of any impacts and minimizes the risk of injury to the vehicle's occupants. Of course, the Volvo XC60's list of safety features doesn't end there. It also offers a Tire Pressure Monitoring System. This feature lets you know if it notices that one of your tires is low on air so that you may re-fill or repair it as necessary.